Molecular electronics has witnessed increased interest in recent years, triggered by the forecast that silicon technology might reach its scalability limits in a few years [1-4]. In order for molecular electronics to become a valuable alternative to silicon technology, it will not be sufficient to fabricate molecular electronic devices with outstanding characteristics, but appropriate circuit and architectural solutions will also be needed. While a lot of effort has been dedicated to the demonstration of electronic functionalities of single molecules and organic films, research at the circuit and system level is still in its infancy [5-9]. Investigation on single molecules or nanotube-based devices promises to keep Moore's law alive once miniaturization of silicon-based structures becomes impractical. 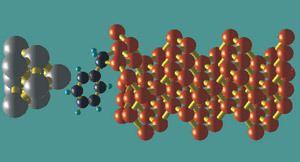 As first proposed by Aviram and Ratner , one can imagine to squeeze entire nonlinear circuit elements (such as diodes or transistors) into single molecules. In principle, such devices could be significantly faster and smaller than end of the roadmap solid-state electron devices. Despite an enormous progress on the experimental characterization of single-molecule conduction in the last years, only few device concepts have emerged and it is still unclear whether individual molecular devices could be integrated into a larger-scale computing circuit. In any case, we can be sure that molecular circuits and architectures will be very different from what we are used to in today's systems. Several architectures, which would be suitable for the realization of electronic logic circuits or memory cells based on molecular devices, have been proposed. One possibility is to synthesize complex molecules whose arms can be separately contacted to provide the same electrical input/output of conventional logic gates. Such fascinating idea, suggested by Ellenbogen and Love , is unfortunately extremely challenging from the chemical-synthesis point of view, and it has not been realized up to now. Another possibility is to create a programmable interconnected network of nanoparticles and molecular entities ("nanocells") : conducting metallic nanoparticles are randomly deposited on a substrate (which can be a silicon one) and subsequently bridged via molecular connections, to create electrical pathways between previously patterned metallic leads.The molecular linkers should exhibit non linear IV characteristics, in the form of negative differential resistance or hysteretic behavior and the network is connected to a limited number of input/output pins at the edges of the nanocell, which could then be accessed, configured and programmed from the edges. Simulations have demonstrated the capability of the nanocell to act as logic gate  . Integration with CMOS technology will certainly be the first step for devices based on single molecules, with solutions that follow a road that has been called "More than Moore" , in an attempt to extend the standard chip functionalities already offered by silicon technology. Such hybrid systems would benefit from the speed and reliability of CMOS, while offering at the same time the versatility and intrinsically nanometer footprint of molecular devices. Two architectures which are in principle compatible with silicon technology are the "Quantum Cellular Automata"  and the "cross bar",  . While the latter, employs solutions based on standard interconnections, the former relies on a highly innovative approach. In fact, devices and their interconnections can no longer be separated in a straightforward way in single-molecule electronics and it is still not clear if the paradigm of classical circuit theory for building a complex system can still be followed  . 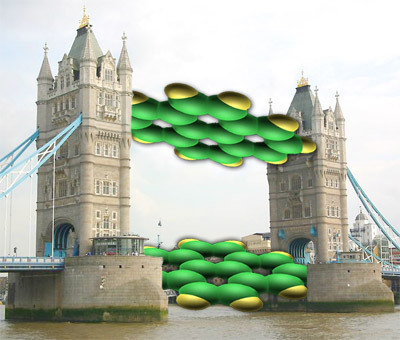 It is very timely to explore alternative ideas to interconnect molecular building blocks inside the molecular circuit and the molecules to the outer world without metal wires , using electric or magnetic fields, too. One very interesting hybrid architecture is the semiconductor/nanowire/molecular one ("CMOL"), proposed by Likharev and coworkers  . The basic difference with respect to cross bars is that in CMOL the interface between CMOS circuitry and nanowires is provided by pins distributed all over the circuit area. Thus, a much larger integration should be achieved, with relaxed requirement concerning alignment of the wire interconnects. 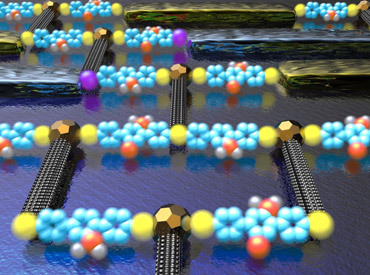 Besides single molecule structures, molecular electronics refers also to the employment of organic materials as substitutes for the solid-state layers of traditional semiconductor devices. Since their carrier mobility is relatively low, organic devices cannot compete with silicon-based circuits in high-speed, high-performance computing applications, but can become competitive in the market of large area devices, because their process technology is potentially inexpensive and circuits can be realized on virtually any substrate (e.g. on plastics, paper or textiles) . We will present our theoretical analysis on organic transistors, inverters and ring oscillators, describing the simulation tools used and its applications to device and circuit modeling. In the areas of chemical sensing, light emission and light sensing, organic materials could make far more versatile devices as their semiconductor counterparts, because of the wide selection of possible sensor and light-emitting materials . Due to their versatility in terms of fabrication and performance, organic films could also be integrated with silicon circuitry. 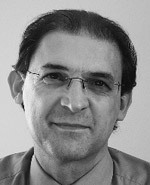 The content of the web page has been created by Dr. Paolo Lugli from the Technical University of Munich. 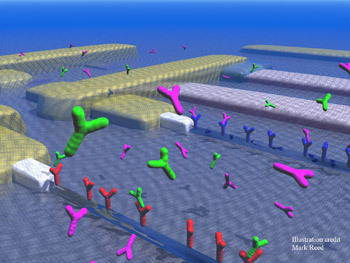 Molecular circuits images provided by Prof. Mark Read from Yale University. J. M. Tour, W. L. Zandt, C. P. Husband, S. M. Husband, L. S. Wilson, P. D. Franzon and D.
 G.Q. Kouchi Zhang, M. Graef and F. van Roosmalen, Proceedings. IEEE 56th Electr. Comp. Neural Networks and Their Applications, 2002. (CNNA 2002).